There are so many fitness equipment in the market and each type are designed for different benefits even though overall their main aim is to make you healthier and more fit just like a rowing machine such as Stamina ATS vs Stamina X. In this article, we are going to give you more information regarding what you can expect from these equipment, so you can choose which suit you better. If you are interested in one or both of them, go check our article below. If you are not familiar with rower machine yet, this fitness equipment is great if you want to achieve weight loss, toning or building your muscles as well as increasing stamina. Unlike many others, this kind of fitness tool will let you develop both your upper and lower body and will give you a serious aerobic workout. 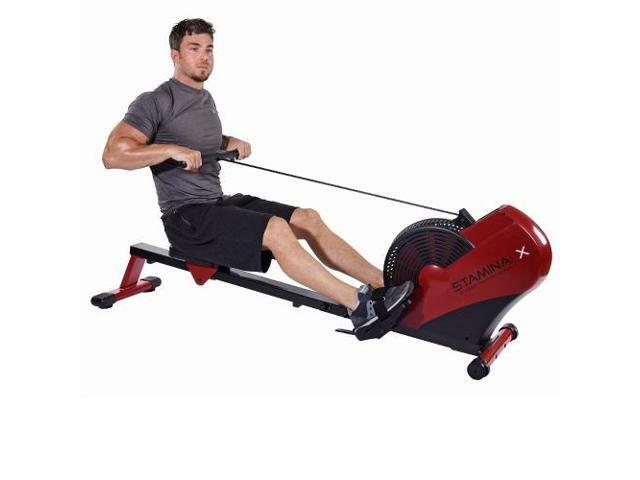 One reliable good rowing machine that you can reach out to is the Stamina ATS, which in this article is the 1399 model. From the outside, the rowing machine looks just like many other air rowing with its wind resistance placed at it’s one side and with a seat that move along its rail. You will use the machine facing its resistance and placed your foot in its pedal to secure them. The seat is padded and feels quite comfortable when used while the handlebar also allow you to grip it tightly during exercise. Another great thing coming from the design is you can fold it when not in used, so it will consume less space. Now let’s dig in into what the machine can offer to you. The first worth mentioning about the machine is its strong build if compared to other cheaper low quality similar air rowing. This product is not cheap but you will get what you pay with its reliable build that can stand user up to 250 pounds without problems. For you who never heard of how air rower works, to put it simply, the harder or faster you pull, the harder the resistance. Read also: Exerpeutic 900XL vs 400XL here. 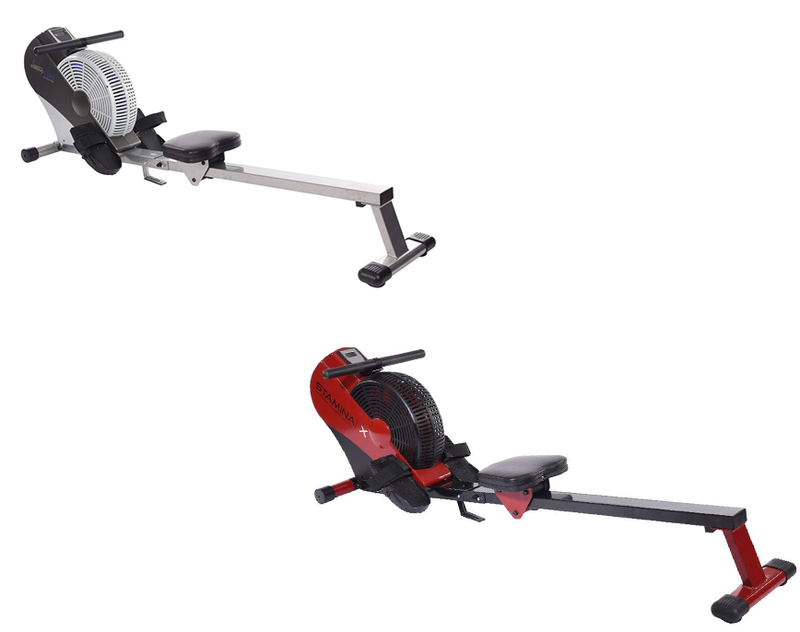 Unlike many other exercise machines with adjustable strength, this type is not adjustable and it will suit the power or hardness depend on how you perform, so it you can make it go easier or harder while rowing. If you want to take it easy, don’t row too hard, so the resistance will be minimal as well as the opposite if you want an intense workout, you have to row harder, which will make the machine also harder to row. Located at the front where you are supposed to face while rowing, there is a small LCD monitor attached, which you can use to see information like time, speed, distance and calories. What’s lacking here is since it is quite small, some people may find it hard to see information from the LCD while unlike some higher-end similar air rower that also comes with heart rate monitor, this one is not, so you will need another device to see your heart rate. If you think the Stamina ATS 1399 model is not for you and you want to find another cost friendly similarly powerful air rower, you may want to take a look at the Stamina X. These two is actually very similar to each other and there seems nothing separate them from each other as they are priced at the same level. If you look up about the product, there is another X series available with rather different design but the one in our article today is the one looks the same like ATS 1399. From the outside, there is nothing that separates the X model with ATS besides the naming and of course color of the product since X series tends to use a combination of black and red to separate it from the other line. You still can have the wind resistance placed at one side covered in a red housing while on top of the panel, you can find a similarly small LCD screen. It also still has foot pedal with strap to secure your foot while exercising. The Stamina X still comes with a reliable build that can take up to 250 pounds weight, so it can suit more people especially those with larger body. The pedal has strap to keep your foot in place and prevent slipping to avoid any possible injuries. The seat itself is padded and comfortable when used while the handlebar is also covered to let your hand grip it tightly when pulling. Since this is an air rower, it works with the same method like ATS, which is not adjustable by setting. The resistance is variable and it means you will have the resistance level just like how you row it. If you a beginner with less experience or never use the same machine before, you can start by rowing slowly, so the resistance will follow and give you minimum resistance but, if you are more experienced and need an intense training, you can row harder/faster to make the machine give you stronger resistance. At the top of the resistance cover above where the handlebar is placed, you can see a small LCD screen, which is useful to track information like time, calories burned, speed, and distance. It is indeed useful but could be improved with wider screen and heart rate monitor with sensor placed on its handlebar. However, it those feature exist, the price probably won’t be so friendly anymore. Now, let’s compare Stamina ATS with Stamina X. As you can see, both of them are coming with the same set of capabilities, appearance, and similar system as well as price tag. There is no clear reason why the company decide to put different name on the product if they have the same features. All in all, the decision is all yours to make. We don’t see any difference except for color from these two air rower, so you can choose which machine suit your taste the most since the features and price are the same.